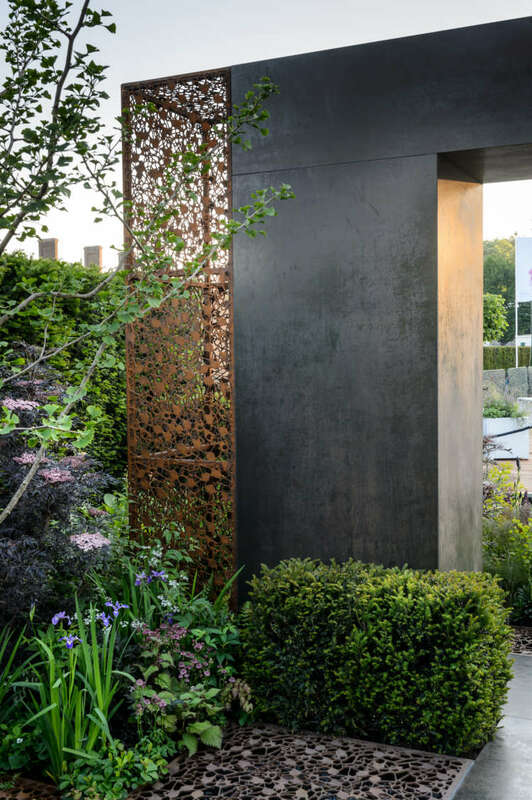 We are delighted to announce that our design and build of ‘Urban Flow’ in partnership with Thames Water has won a coveted Royal Horticultural Society Gold Medal. We were also honoured to be presented with the prestigious best in category for a ‘Space to Grow’ garden by Director General Sue Biggs. 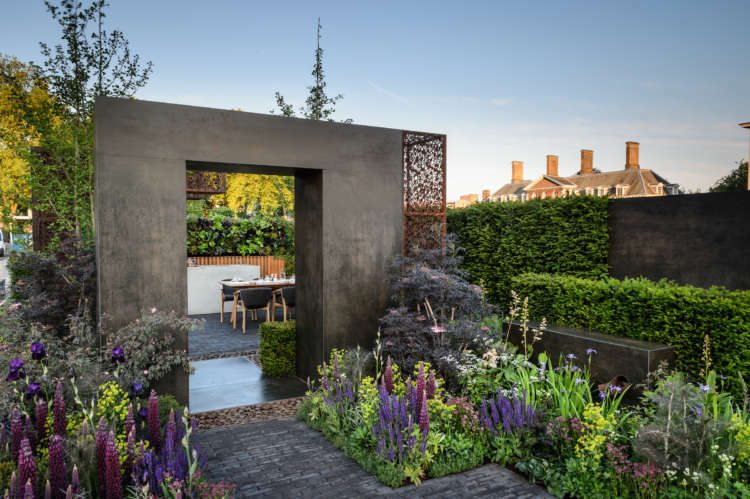 The awards recognise the incredible quality of design and craftsmanship achieved by Garden Club London’s highly skilled and dedicated team. 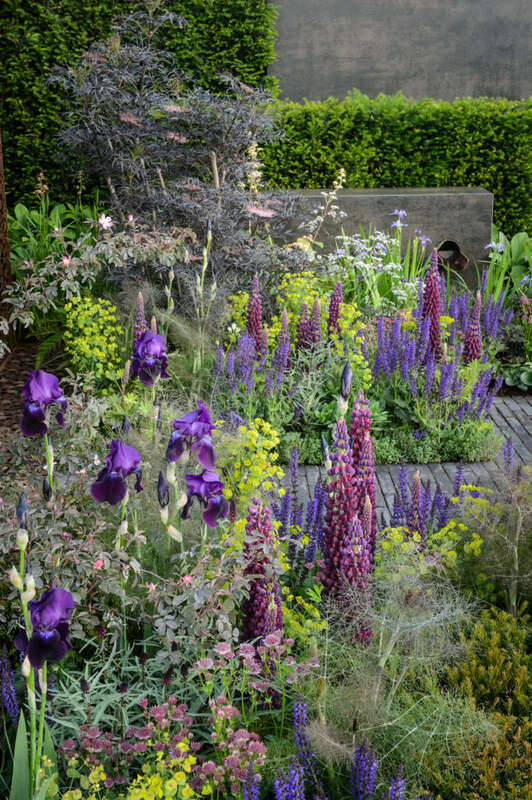 The garden features rich velvet colours of Lupin, Salvia, and Lysimachia punctuated with Sambucus nigra ‘Black Lace’ and Rosa glauca set against a back drop of dark steel ‘design clad’ that forms an oversize arch. 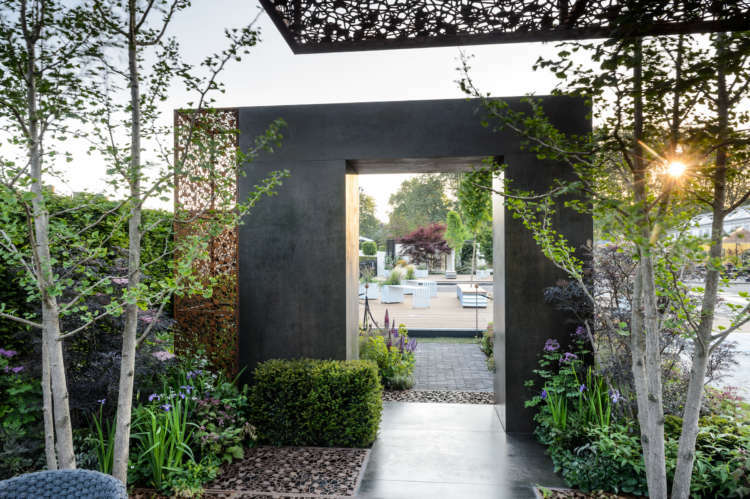 As you enter the garden 3 multi-stemmed Ginkgo biloba trees cast subtle shadows and provide shade. 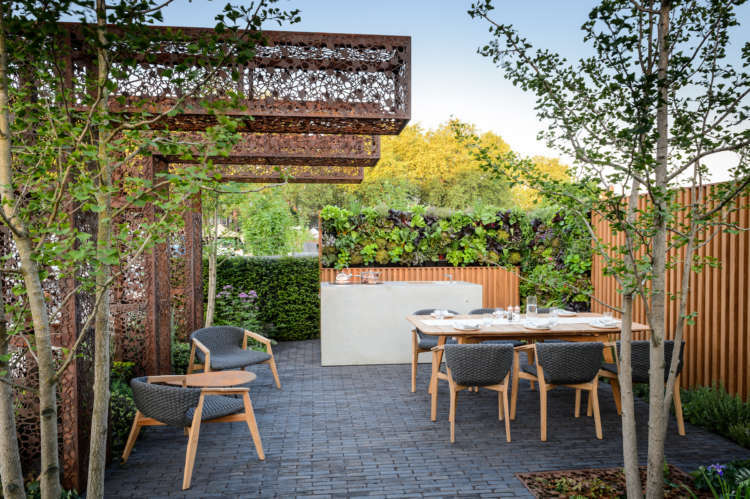 A laser cut cantilver pergola structure provides shade and privacy to the overlooked urban plot imagined as a terraced house in London. 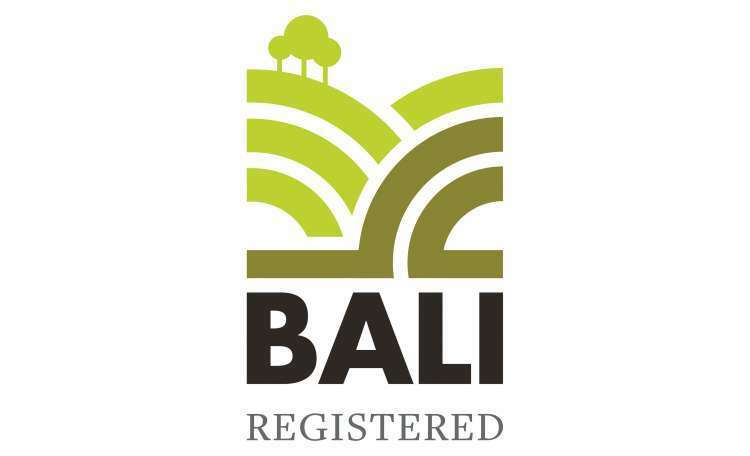 Contemporary Garden furniture provided by ‘Ethimo’ provides a dining area for a family with teenage children to enjoy outdoor meals together with meals prepared on the outdoor kitchen supplied by Dade design set against a back drop of edible living wall that provides herbs, fruit, salad and edible flowers. 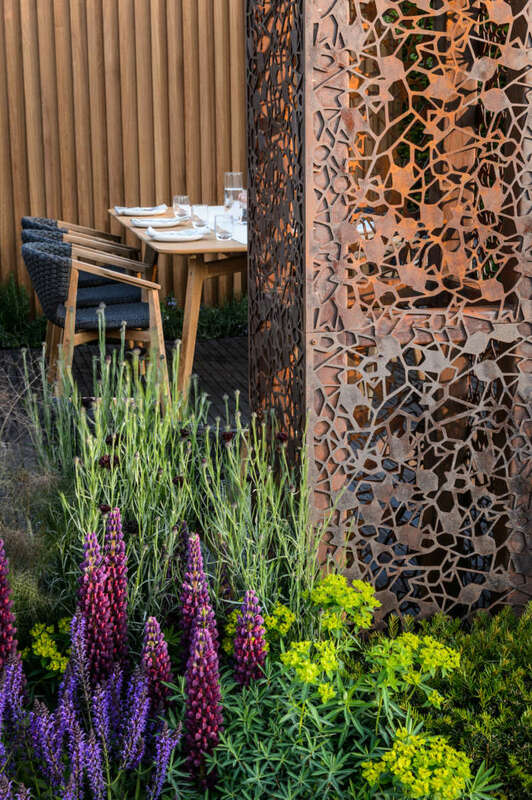 The laser cut structures use ‘Flow’ design, developed for our show garden by Stark and Greensmith and launched into their core range of product. Permeable clay brick paving has been generously supported by Vandemoortel. Keep up to date with all of the events and inspiring projects in the studio and on site on our facebook page, twitter and instagram.